District Court, Eastern District of California, Case 2:10-at-00928 LOMBARD v. EMAAR USA et al. almost two years, beaten and tortured in Dubai and Abu Dhabi. minor civil disputes. Emaar and Mr. Alabbar became incensed at Lombard after local media picked up his story. 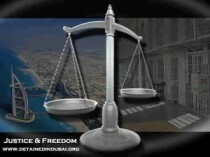 The lawsuit also charges Emaar’s USA Division with unfair competition under California law. Emaar is the developer of the ultra luxury Beverly West tower in Los Angeles. According to attorney Jonathan Levy, Emaar engages in illicit business practices by imprisoning and torturing its critics.